Wow, what a long title. 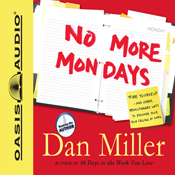 This is a book that I have heard Dave Ramsey recommend time and time again to listeners of his radio show when they have job issues. I really enjoyed this book; I found it to be very motivating even though I am not looking for a new job or career. Looking at my job as a part of my calling and not just a grind that I do to make ends meet has become really important to me. Realizing that the only job security you have is your ability to find your next one is very important in the world we now live in. It is now very rare for anyone to have the same job or even vocation for 20 years or more much less retiring from a company with a meaningful pension, so it is up to us to fund our own retirement and provide financial security for our families. Working at something you love will make that a lot easier and increase your chance of success and happiness. This book may give you some ideas of how to accomplish that goal. I rate this book as a 8 out of 10 and recommend it to anyone that is unhappy in their current job. I purchased this book at Audible. Dan Miller has also written a book name “48 Days to the Work You Love” which may be more appropriate for people trying to find a job they can be passionate about. I have been listening to and reading some business books this year, and have heard a lot of good things about Seth Godin. When I looked at the books available on Audible by Mr. Godin most of them were focused on marketing which I do not have a lot of interest in. But “Linchpin” sounded really interesting. Doesn’t that sound good? 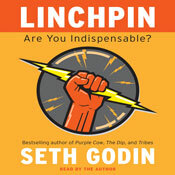 I want to be a Linchpin, who wouldn’t want to be a Linchpin as described above? But I don’t think I got a whole lot out of the book. I remember thinking more about how much was left to listen too than about what was being said. I agree with a lot of what is said in the book, but the way it is being said left me bored and inattentive. On a scale of 1 to 10 I give this book a 4, I think that low score has more to do with the style of writing or the voice of the book than the quality of the content. I bought this book on Audible. I bought this book on Audible. 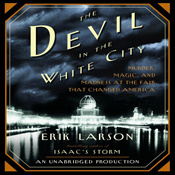 This is the story of the 1893 World’s Columbian Exposition in Chicago and the murderous Dr. Henry H. Holmes. This story grabbed me and would not let me go. I took a lot of walks and sat in the car in the driveway a lot so that I could listen to it. Learning about the work that went into creating the White City, the personalities involved, and the problems that they faced along with the horrible crimes of a 19th century serial killer held my attention to the very end. I rate this book a 9 out of 10 and a great non-fiction read. 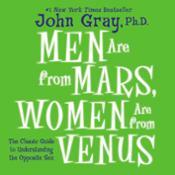 I bought this book from Audible, it is narrated by the Author. It turns out that there are differences between men and women, who knew. After listening this book the differences are much clearer and now I have some ideas how those differences can be approached in a positive way. I expect what I have learned to make a real difference in my relationships with both men and women. I rate this book a 9 out of 10 and a must read. Harold Davis’ new book on taking digital color photos and transforming them into creative black and white pictures is an inspiring read with a lot of examples and many ways to achieve your vision. A focus of the book is to help you learn how to pre-visualize what the world of color that surrounds us in blank & white. To se the contrasts of light and shadow that are left when the color is removed from an image and I think the book does a good job of describing how to do that. I really like the different ways that are covered in the book to transform your color images into blank & white, Photoshop, Lightroom, Silver Efex Pro, and Photomatix are all covered. Creating images with high-hey, low-key, split toning, HDR, hand coloring, and noise are all explored with examples and tips. I found the HDR example especially interesting, using HDR methods to create a photo with a extraordinary range of shadows is really appealing to me and I plan on giving it a try soon. I highly recommend this book to anyone with an interest in making amazing black & white photos. I want to thank the author for the chance to review this book before its release.